Anil Sharma was sworn in as Cabinet Minister at Raj Bhawan, here today. 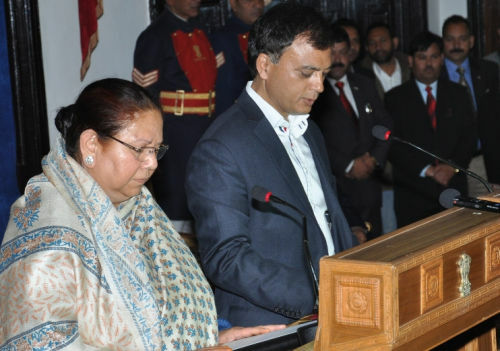 Governor Urmila Singh administered the oath of office and secrecy to him. Anil Sharma has been given the portfolio of Rural Development & Panchayati Raj and Animal Husbandry. 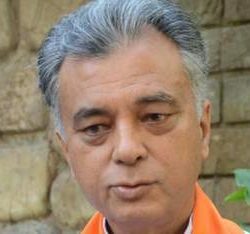 Anil Sharma was elected to Himachal Pradesh Vidhan Sabha for the 3rd time during the recently concluded Vidhan Sabha elections. Earlier, he was elected to state Assembly in 1993 and 2007. He remained Youth Services, Sports and Forest Minister in 1993. 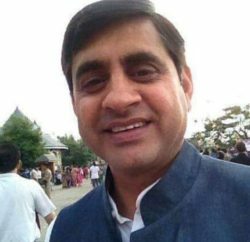 He was also elected to Rajya Sabha and remained Member of Railway, Food Civil Supplies and Public Distribution Committees of the House and also Member of Consultative Committee of Tele-Communication & Information Technology Ministries. Chief Minister Virbhadra Singh, Vidhan Sabha Speaker Brij Bihari Lal Butail, Cabinet Ministers, Vidya Stokes, Thakur Kaul Singh, G.S. Bali, Sujan Singh Pathania, Thakur Singh Bharmouri, Mukesh Agnihotri, Sudhir Sharma, Prakash Chaudhry, Dhani Ram Shandil and Pratibha Singh, Chairperson of Hospital Welfare Section of Indian Red Cross Society, Himachal Pradesh and Vice Chairperson of H.P State Branch of Indian Red Cross Society, were also present on the occassion. Pt. Sukh Ram, former Union Minister and father of Anil Sharma and other members of his family were also present on this occasion. 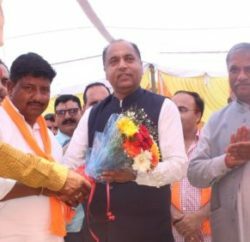 Neeraj Bharti, Chief Parliamentary Secretary, Kewal Singh Pathania, Vice Chairman HRTC, Sanjay Chauhan, Mayor, Tikender Panwar, Deputy Mayor, M.C. Shimla, Sarwan Dogra, Advocate General, B.Kamal Kumar, DGP, Senior Officers of State Government, Dinesh Malhotra D.C. Shimla , and Abhishek Dullar, S.P. were also present on the occasion. Chief Secretary S Roy conducted the proceedings.